Pumpkin puree simmers with curry spices, chickpeas and kale for a healthy and flavorful meal. Heat the oil in a pan over medium heat. Add the onions and carrots, cook until they begin to soften, about 10 minutes. Add the garlic and cook for another two minutes. Add the curry powder, ginger and cinnamon, stir to combine. Cook for about 2 more minutes. Stir in the vegetable broth, chickpeas and pumpkin puree. Add the potatoes, kale and cauliflower if using. Bring the liquid to a boil, then reduce heat to a simmer. Simmer covered, stirring occasionally, until the potatoes are soft. This will take about 25 to 30 minutes. When the potatoes and other vegetables are tender, you are ready to eat. 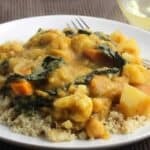 Scoop out a serving of the curry, and serve over couscous or rice. Enjoy!